Imagine living a short stroll from an exceptional bay beach in a spacious home with beautiful water views – welcome to your new beachside home! 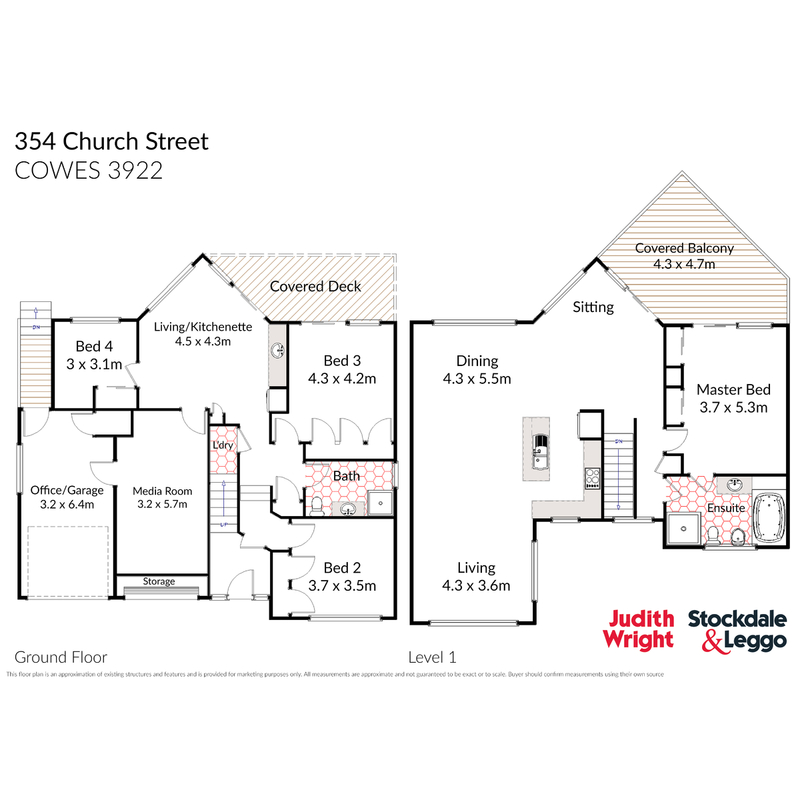 Spread across two generous levels, the home is designed to offer the flexibility of separate upstairs and downstairs living zones, or one large comfortable family home. The upper level provides a huge master bedroom with built in robes and ceiling fans, which also extends onto the north facing balcony, capturing the water views beyond. The master bedroom adjoins a large en-suite with luxurious oval spa bath, separate shower, toilet and bidet, the en-suite can also be accessed from the main living area. The family-friendly kitchen includes an electric cooktop, wall oven and large island bench, and adjoins an extensive upper level living and dining zone which provides outstanding bay and Peninsula views from the expansive windows, before merging onto a large undercover balcony – the perfect space for outdoor dining and to watch the ships in the bay or enjoy the lights from the Mornington Peninsula. The lower level provides 3 spacious bedrooms, all with built in robes, a central kitchenette and dining area which opens onto the undercover deck, family sized bathroom and European laundry. A huge double garage is currently fitted out one side as the perfect 'mancave' or ideal teenager's retreat and the additional side as a light and bright office with 3 phase power. The lower level is fully self-contained and could be utilised as a separate residence or holiday accommodation. The property is beautifully landscaped with low maintenance lush gardens and fruit trees, with the addition of a rear freestanding undercover entertaining area with fire pit. Fully fenced, the property provides easy side access to the large secure rear yard, ideal for boat and caravan storage. Live the island dream with this amazing property, or invest in a beachside dual occupancy opportunity. Perfectly located only a short stroll from the sandy foreshore, enjoy long summer days at the beach and leisurely walks along the water's edge to the nearby Café and into central Cowes. Act quickly and you could secure this outstanding property for the coming summer.